Is Israel Hiding That Its F-35 Warplane Was Hit By Syrian S-200 Missile? A Síria diz que acertou num avião israelita com um míssil S-200 e Israel diz que um F-35 bateu num bando de pássaros. Os mesmos de sempre a lançar rumores. Se foi um S200 que o atingiu e ele aterrou com umas amoladelas.......bem o F35 é bom!! Para além de furtivo é blindado! Segundo os Israelitas foram duas cegonhas e não um bando de pássaros. É mesmo aquela propaganda barata dos sírios. O S-200 é completamente obsoleto. No entanto não sabia que Israel já utiliza o F-35 em operações. After years of civil war, Syria is now a country that lies in ruins. Thousands of people have died, millions have fled. With no end of the war in sight, groups continue to battle for control over large parts of the country. 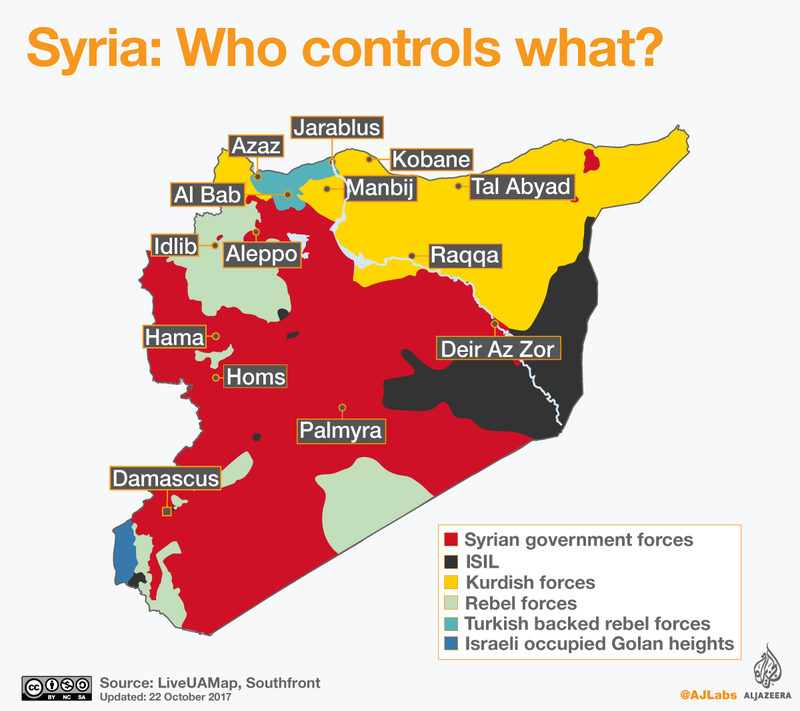 The Syrian government, the Islamic State of Iraq and the Levant (ISIL, known as ISIS), Kurdish factions, and several other rebel groups are still fighting for some of the most important parts of the country. Government troops, supported by Russian war planes, have gained some ground over the past few months, expelling ISIL from Palmyra and other important places. At the end of 2016, the Syrian government managed to capture Aleppo, one of the main battlegrounds in the conflict. Meanwhile Kurdish fighters have made gains in the northern part of Syria, reducing the territory under control by ISIL. Turkish troops recently joined the fight against ISIL, expelling the group from the city of Jarablus. ISIL has not only been losing territory in Syria, but also in Iraq, where the Kurds and the Iraqi Security Forces recently recaptured ISIL's last stronghold, Mosul. 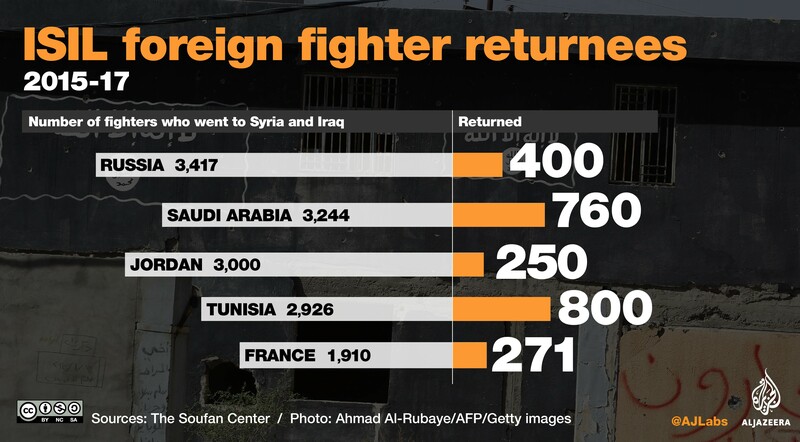 Thousands of of foreign ISIL supporters have returned to their home countries after leaving Syria and Iraq over the past two years, a US-based security analysis group has said. At least 5,600 people from 33 countries left ISIL-held areas in that period, with numbers increasing as the group began to suffer territorial losses, the Soufan Center said in a report published on Tuesday. The figure, based on official government records, included women and children, Jeffrey Ringel, a director at the Soufan Center, told Al Jazeera. More than 40,000 foreigners from 100 countries joined ISIL before and after the group declared the establishment of a "caliphate" in 2014 after seizing large swathes of territory in both Syria and Iraq. Thousands have been killed on the battlefield as Syrian and Iraqi forces captured major strongholds and urban centers, leaving ISIL only in control of a sliver of land along the Euphrates on the Syria and Iraq border. ISIL's self-proclaimed capital in Syria, Raqqa, fell to the US-backed Syrian Democratic Forces earlier this month. In June, Iraqi forces ousted the group's fighters from Mosul, Iraq's second-biggest city.